Submitted by Hatamoto on February 18, 2009 - 1:00am. Submitted by Disco Science on February 18, 2009 - 2:18am. Holy crap, 400 is a big number! Way to go, and I like the new site! Submitted by Sparrowsabre7 on February 18, 2009 - 2:21am. Trevor looks a lot like Vash the Stampede from Trigun there lol...if that is Trevor I'm not quite sure =P I assume it is. Submitted by firstRainbowrose on February 18, 2009 - 2:51am. Oo la la! I like the new layout. It's very nice. Submitted by ubercaffeine on February 18, 2009 - 3:25am. Submitted by kwsn on February 18, 2009 - 6:35am. Submitted by Kira on February 18, 2009 - 7:31am. Submitted by TehMachinist on February 18, 2009 - 8:34am. Ugly dood with hacking cough approves of this new layout. Submitted by 0netnet0 on February 18, 2009 - 8:58am. Submitted by raaaaaa on February 18, 2009 - 9:26am. Submitted by The Phantom Patriot on February 18, 2009 - 9:31am. Submitted by alucard_101 on February 18, 2009 - 9:42am. Submitted by Jam on February 18, 2009 - 9:46am. I actually have the same coat, but in white! Submitted by Lirunel on February 18, 2009 - 10:16am. Submitted by Telruya on February 18, 2009 - 11:35am. Nice new look for the site. Submitted by Lightstarr on February 18, 2009 - 12:06pm. Hahaha. I bet he really is Jam. I, like many, think the new site is purty! Submitted by Gilder on February 18, 2009 - 12:33pm. No, see, if he WERE from the future, he'd wear a visor of some sort. Submitted by sharidar on February 18, 2009 - 12:55pm. oh dang the site got all changed around!!!! Submitted by alucard_101 on February 18, 2009 - 1:20pm. Submitted by Trogo on February 18, 2009 - 1:56pm. Submitted by zzw on February 18, 2009 - 3:30pm. so excited.Ive been following you comics for a while. They are absolutely fantastic.love the new look. Wish you all the best. Submitted by surgingshark on February 18, 2009 - 3:57pm. Submitted by Haioko on February 18, 2009 - 6:05pm. Submitted by Hadrian77x7 on February 18, 2009 - 6:21pm. 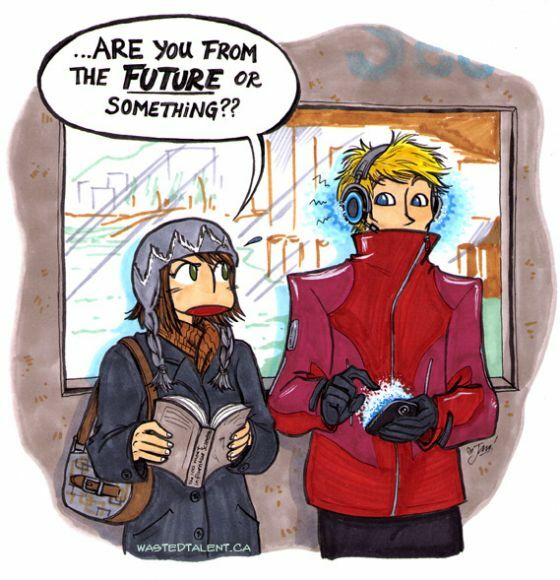 as for the comic... doesn't the coat make you think more retro 80s than future? Maybe just me.. Submitted by QueenMonko on February 18, 2009 - 9:27pm. Submitted by kaitco on February 18, 2009 - 10:12pm. Submitted by Jam on February 18, 2009 - 10:49pm. And yeah, QueenMonko, I do a lot of the coding on this site. Spikecomix.com is almost 100% me, but due to the weird history of this site, WT.ca is a mix of my work and Trevor's . Trevor helps a LOT, especially with bug identification and optimization. I can make it work... mostly, but Trevor says my code is "hideous". Hey, at least I can code. Submitted by Omnomplz on February 18, 2009 - 11:53pm. Submitted by Sutokito on February 19, 2009 - 2:01am. Whoa! @@ Awesome new design. Spiffy new navigation buttons. Submitted by BradleyF81 on February 19, 2009 - 7:48am. I love the new look! The comic is great too! ... it would explain everything!